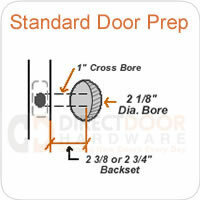 We carry a huge selection of the best door hardware brands in the industry today. Whether you are looking for entry level Schlage or Kwikset locks, or higher end Baldwin or Emtek we have the door hardware for your project. We'd love to help you with your residential or commercial project. Can't find the manufacturer you are looking for? Let us know, we have several other brands available to us that are currently not on our website. Why is one manufacturers product so much more than another's when the style looks similar? This is a great question. There are many handles that look very similar from one manufacturer to another, yet the pricing is very different. For example, just about every door hardware manufacturer makes and egg shaped knob. Sure-Loc's egg shaped knob is very affordable, while Emtek similar door knob is much more costly. In this case, the Sure-Loc knob is a zinc die cast hollow doorknob where the Emtek is constructed of solid brass. The solid brass knob is much more solid and nicer, but of course the Sure-loc is so much more affordable that may not be worth the cost to you. Other factors can effect the price like brand name reputation, warranty coverage, distribution channels, product origin and more. All of the door hardware manufacturers we work with set their own pricing based on all of the above. Can I replace just the lever on my handleset with another brand I like? It would make life pretty easy if all door hardware manufacturers made their hardware the same way. We have customers ask us all the time if they can replace the inside knob of their Schlage handleset with an Emtek lever that they like. Or someone might have a vintage skeleton key lock and really don't want to replace the old skeleton key box, or their door but they want a popular Juneau Modern lever. Unfortunately, every manufacturer does things a little differently. Sure, there are a few entry level brands that are very similar, but for the most part, if you have Schlage locks, you'll only be able to replace parts with other schlage locks. As a result, you generally just have to replace the whole lockset if a part is worn out or you don't like the style anymore. The reality is, the parts often cost close to, or as much as an entire new door lock. Which Manufacturer Has the Best Warranty? This is a good question. The warranty from one manufacturer to another will vary quite a bit. The reason is that every door hardware manufacturer produces their products differently and the duration or extent that they might warranty a door hardware product is completely up to them. As you browse our website, you'll generally find the warranty information on one fo the description tabs. You can also find warranty information on our general door hardware manufacturer warranty page. It's a good idea to read up on the warranty before you purchase so you know what to expect. We're happy to help you with any kind of warranty claim on a door hardware product purchased from us. You're also welcome to work directly with the manufacturer - though most hardware manufacturers will refer you back to the place you purchased it.